The 43rd Chess Olympiad, organised by the Fédération Internationale des Échecs (FIDE) and comprising open and women's tournaments, as well as several events designed to promote the game of chess, was held in Batumi, Georgia, from 23 September to 6 October 2018. This was the first Chess Olympiad to take place in Georgia with the Georgian Chess Federation also hosting the Chess World Cup 2017 in Tbilisi. The International Braille Chess Association (IBCA) is organization for blind and visually impaired chess players. The IBCA is a FIDE-affiliated chess organization as well as a part of the International Blind Sports Federation. The International Braille Chess Association originated informally in 1951 with the organization of the first international correspondence chess tournament for blind players, by Reginald Walter Bonham; the tournament included 20 players representing 10 countries. It first organized an over-the-board tournament in 1958, with representatives from seven countries. Today, it has grown to encompass over 50 member nations around the world. The IBCA hosts two major competitions: the Blind Chess Olympiad and the Blind World Chess Championship. The women's event at the 42nd Chess Olympiad, organised by the Fédération Internationale des Échecs (FIDE), was held from 2–13 September 2016 in Baku, Azerbaijan. It is contested by a record number of 142 teams representing 138 nations. Azerbaijan, as host nation, field three teams, whilst the International Physically Disabled Chess Association (IPCA) and the International Chess Committee of the Deaf (ICCD) each provide one team. A total number of 693 players are participating in the women's event. A Swiss-system tournament is a non-eliminating tournament format which features a set number of rounds of competition, but considerably fewer than in a round-robin tournament. In a Swiss tournament, each competitor does not play each other. Competitors meet one-on-one in each round and are paired using a set of rules designed to ensure that each competitor plays opponents with a similar running score, but not the same opponent more than once. The winner is the competitor with the highest aggregate points earned in all rounds. All competitors play in each round unless there is an odd number of players. A time control is a mechanism in the tournament play of almost all two-player board games so that each round of the match can finish in a timely way and the tournament can proceed. Time controls are typically enforced by means of a game clock, where the times below are given per player. Time pressure is the situation of having very little time on a player's clock to complete their remaining moves. In chess, a draw by (mutual) agreement is the outcome of a game due to the agreement of both players to a draw. A player may offer a draw to his opponent at any stage of a game; if the opponent accepts, the game is a draw. The relevant portion of the FIDE laws of chess is article 9.1. 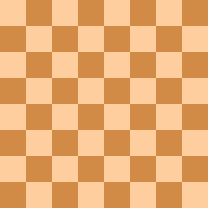 The vast majority of drawn chess games at the amateur club/tournament level and higher are draws by mutual agreement rather than the other ways a game can be drawn. Georgia Time (GET) is a time zone used in Georgia and it is uniform throughout the country. It moved from zone UTC+04:00 to UTC+03:00 on June 27, 2004, then back to UTC+04:00 on March 27, 2005. This section uses algebraic notation to describe chess moves. In this position, Mammadzada made a blunder by playing 106. Kh4? (106. Kh2 would have saved the game) and resigned immediately after 106... Kf3. This position has arrived at after 1. d4 d5 2. c4 c6 3. Nf3 Nf6 4. Nc3 dxc4 5. e4 b5 6. Be2 Bg4 7. h3 Bh5 8. e5 Nd5 9. e6. Here Sargsyan played 9... fxe6?, which allowed Ushenina to launch a strong attack and leave her in a desperate position. Black resigned after White's 20th move. Women's World Chess Champion Ju Wenjun of China was the best individual player in the Women's event. Average ratings calculated by chess-results.com based in September 2016 ratings. Anna Olehivna Muzychuk is a Ukrainian chess grandmaster. From 2004 to 2014 she played for Slovenia. 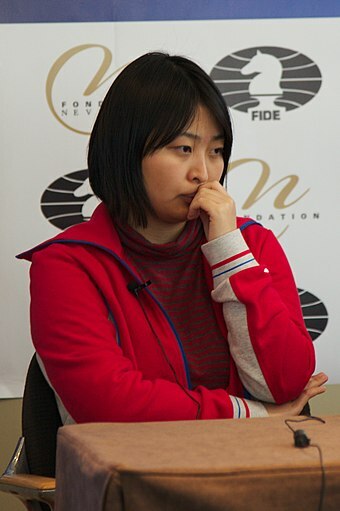 She is the fourth woman, after Judit Polgar, Humpy Koneru and Hou Yifan, to cross the 2600 Elo rating mark, having achieved a rating of 2606 in July 2012. The 36th Chess Olympiad, organized by the Fédération Internationale des Échecs (FIDE) and comprising an open and a women's tournament, as well as several events designed to promote the game of chess, took place between October 14 and October 31, 2004, in Calvià on the Spanish island of Majorca. There were 129 teams in the open event and 87 in the women's event. In total, 1204 players were registered. Hou Yifan is a Chinese chess grandmaster and four-time Women's World Chess Champion. A chess prodigy, she is the youngest female player ever to qualify for the title of grandmaster and the youngest ever to win the Women's World Chess Championship. The Women's World Chess Championship (WWCC) is played to determine the women's world champion in chess. Like the World Chess Championship, it is administered by FIDE. Tan Zhongyi is a Chinese chess grandmaster (GM) and former Women's World Chess Champion (2017–2018). Anna Yuriyivna Ushenina is a Ukrainian chess grandmaster who was Women's World Chess Champion from November 2012 to September 2013. The 39th Chess Olympiad, organised by FIDE and comprising an open and a women's tournament, as well as several other events designed to promote the game of chess, took place from September 19 to October 4, 2010 in Khanty-Mansiysk, Russia. There were 148 teams in the open event and 115 in the women's event. In total, 1306 players were registered. The 40th Chess Olympiad, organised by the Fédération Internationale des Échecs and comprising an open and women's tournament, as well as several events designed to promote the game of chess, took place in Istanbul, Turkey, from 27 August to 10 September 2012. The city also hosted the event in 2000. The 41st Chess Olympiad, organised by the Fédération Internationale des Échecs (FIDE) and comprising an open and women's tournament, as well as several events designed to promote the game of chess, took place in Tromsø, Norway, between 1–14 August 2014. The organiser was Chess Olympiad Tromsø 2014 AS on behalf of FIDE. Mariya Olehivna Muzychuk is a Ukrainian chess grandmaster and Women's World Chess Champion from April 2015 to March 2016. She is also a twice women's champion of Ukraine, World Team and European Team champion with Ukraine in 2013 and bronze medal winner of the 2012 and 2014 Chess Olympiad with Ukraine. The Women's World Chess Championship 2012 was a knockout tournament, to decide the women's world champion. The title was won by Anna Ushenina of Ukraine for the first time. Defending champion Hou Yifan went out in the second round. The 42nd Chess Olympiad, organised by the Fédération Internationale des Échecs (FIDE) and comprising an Open and Women's tournament, as well as several events designed to promote the game of chess, was held in Baku, Azerbaijan, from 1–14 September 2016. It was the first time that the Chess Olympiad had been hosted in Azerbaijan, the birthplace of former world champion Garry Kasparov; however, Azerbaijan had previously hosted strong tournaments, including the annual Shamkir Chess super-tournament in memory of Vugar Gashimov (1986–2014) and the Chess World Cup 2015. Alina Kashlinskaya is a Russian chess player who holds the titles of international master and woman grandmaster. The FIDE Women's Grand Prix 2015–16 was a series of five chess tournaments exclusively for women, which determined one player to play in the Women's World Chess Championship Match 2018, a 10-game match against the knockout world champion. The open event at the 42nd Chess Olympiad, organised by the Fédération Internationale des Échecs (FIDE), was held from 2–13 September 2016 in Baku, Azerbaijan. It had to be contested by a record number of 180 teams representing 175 nations, however 10 of these did not arrive so the actual participation was 170 teams. Eritrea, Kosovo, and South Sudan all made their debut at the Chess Olympiads. A total of 894 players participated in the open event. Alireza Firouzja is an Iranian chess player. A chess prodigy, he won the Iranian Chess Championship at age 12 and completed the requirements for the title Grandmaster at the age of 14. The open event at the 43rd Chess Olympiad was held from 24 September to 5 October 2018. It was contested by a record number of 185 teams, representing 180 nations. Georgia, as host nation, fielded three teams, whilst the International Braille Chess Association (IBCA), the International Physically Disabled Chess Association (IPCA), and the International Chess Committee of the Deaf (ICCD) each provided one team. A total of 920 players participated in the open event. Khanim Balajayeva is an Azerbaijani chess player holding the titles of Woman International Master (WIM) since 2018, Woman FIDE Master (WFM) since 2015 and Woman Candidate Master (WCM) since 2013. 1 2 "43rd Olympiad Batumi 2018 Women". Chess-results.com. ↑ "43rd Olympiad Batumi 2018 Open - Alphabetical list of players in the Women's event". Chess-results.com. 1 2 3 "43rd Chess Olympiad: Double gold for China!". FIDE. 5 October 2018. 1 2 3 4 "The best player per board: according Ratingperformance - Women". Chess-results.com. 1 2 "FIDE Handbook: Olympiad Pairing Rules". FIDE. ↑ "43rd CHess Olympiad Batumi - Invitation" (PDF). Batumi Chess Olympiad Organizing Committee. p. 11. Retrieved 24 September 2018. ↑ "Teams – Women". official website. Retrieved 24 September 2018. 1 2 3 Mike Klein (10 August 2018). "Chess Olympiad Lineups Announced; Russian Streak Ends". Chess.com. 1 2 "USA favourites as Olympiad set to begin in Batumi". Chess24.com. 22 September 2018. ↑ "43rd Olympiad Batumi 2018 Women - Georgia". Chess-results.com. ↑ http://chess-results.com, Dipl.Ing. Heinz Herzog -. "Chess-Results Server Chess-results.com - 43rd Olympiad Batumi 2018 Women". chess-results.com. ↑ "43rd Chess Olympiad - Round 1". FIDE. 25 September 2018. ↑ Colin McGourty (25 September 2018). "Batumi 2018, 1: Isolated heroes". Chess24.com. ↑ "43rd Chess Olympiad - Round 2". FIDE. 26 September 2018. ↑ Colin McGourty (26 September 2018). "Batumi 2018, 2: Uzbekistan shock Russia". Chess24.com. ↑ "43rd Chess Olympiad - Round 3". FIDE. 27 September 2018. ↑ "43rd Olympiad Batumi 2018 Women - Board pairings in Round 3". Chess-results.com. ↑ Colin McGourty (27 September 2018). "Batumi 2018, 3: USA set up India showdown". Chess24.com. ↑ "43rd Chess Olympiad - Round 4". FIDE. 28 September 2018. ↑ Colin McGourty (28 September 2018). "Batumi 2018, 4: Kramnik falls as Poland beat Russia". Chess24.com. ↑ "43rd Chess Olympiad - Round 5". FIDE. 29 September 2018. ↑ Colin McGourty (29 September 2018). "Batumi 2018, 5: Shak attack!". Chess24.com. ↑ Colin McGourty (1 October 2018). "Batumi 2018, 6: Azerbaijan and Poland lead". Chess24.com. ↑ "43rd Chess Olympiad - Round 6". FIDE. 1 October 2018. 1 2 "43rd Olympiad Batumi 2018 Women - Ranking list after Round 6". Chess-results.com. ↑ Colin McGourty (2 October 2018). "Batumi 2018, 7: The tension builds". Chess24.com. ↑ "43rd Olympiad Batumi 2018 Women - Board pairings in Round 6". Chess-results.com. ↑ "43rd Chess Olympiad - Round 7". FIDE. 2 October 2018. ↑ Colin McGourty (3 October 2018). "Batumi 2018, 8: USA lead as Fabi beats Shak". Chess24.com. ↑ "43rd Chess Olympiad - Round 8". FIDE. 3 October 2018. ↑ Colin McGourty (4 October 2018). "Batumi 2018, 9: Nakamura loses as Poland beat USA". Chess24.com. ↑ "43rd Chess Olympiad - Round 9". FIDE. 4 October 2018. ↑ Colin McGourty (5 October 2018). "Batumi 2018, 10: China-USA showdown". Chess24.com. ↑ "43rd Chess Olympiad - Round 10". FIDE. 5 October 2018. ↑ "43rd Olympiad Batumi 2018 Women - Board pairings in Round 10". Chess-results.com. 1 2 Mike Klein (5 October 2018). "Chess Olympiad: China Wins Double Gold". Chess.com. 1 2 "Final Ranking after 11 Rounds - Women". Chess-results.com.